This Monday’s Christian Science Monitor’s Magazine will have a short piece on book trailers and chose to begin it with STARTERS. They also used a still from our trailer to illustrate it. 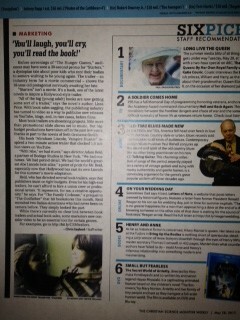 The writer saw the trailer when he went to THE HUNGER GAMES film and remembered it for this article. We did a phone interview and if you’ve never done an interview, it’s about talking for twenty minutes to have it distilled to one short sound bite that might sound a little… odd… taken out of context. But hey, being a writer, I’m probably too picky about my words. One of my writer’s group is an ex-journalist and I have a lot of respect for the profession. There is so much work that you don’t see behind each piece. Next Post: Be STRUCK – win the book and meet Jennifer Bosworth here! YAY!!!! I will check for it at the LMC!